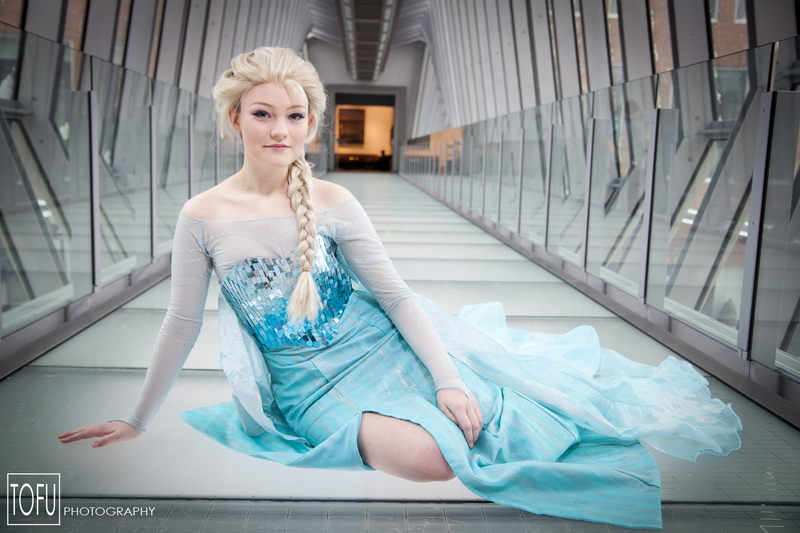 These gorgeous photos were taken back at Ohayocon 2014 with Sarah from Friese Frame Photography. 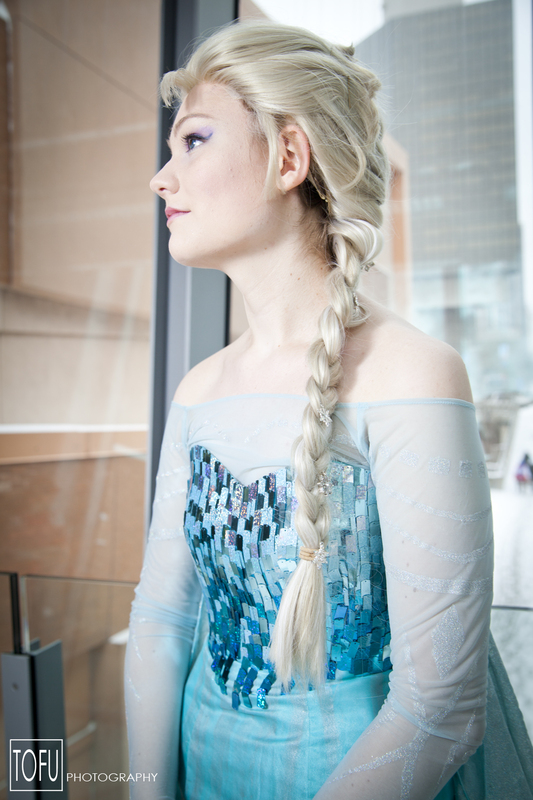 I am so sorry I completely forgot to post the final photos on this blog! Anyways, They turned out so lovely and I am so glad to have had the chance to work with Sarah. 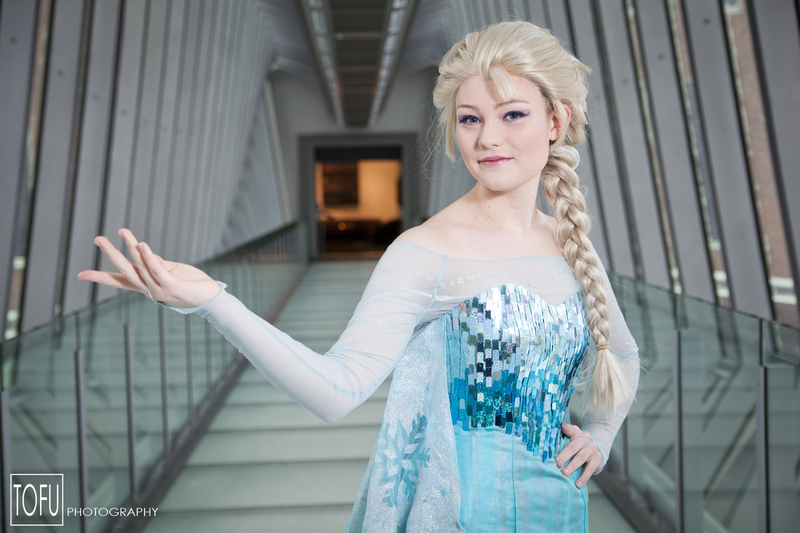 Be sure to check out her other works! Click here to see all the photos from the shoot. If you guys want more updates or casual posts from me be sure to follow me on Facebook and Tumblr. I am going to be using this blog to be posting just more official updates and walk-throughs. 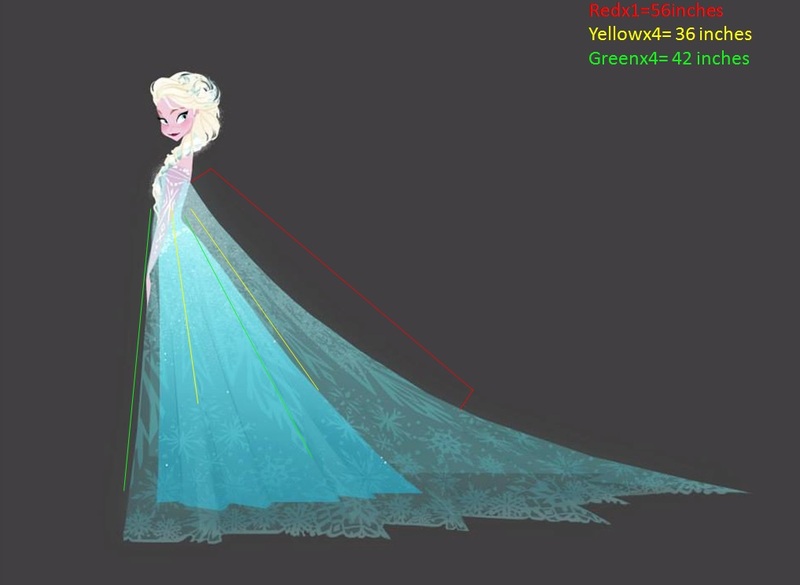 Elsa’s cape/train has this gorgeous snowflake and icicle design. It is quite detailed and requires a lot of time and patience. Unfortunately, I do not have my own magical snow powers so I had to make my train out of glitter instead of snow. Make sure to read part one of my walkthrough to see all the materials I used and where to get them. The first thing I did to create the design was grab a bunch of paper to recreate the patterns. For the large icicle designs, I took the concept art (shown above) and made the designs proportional to my personal height. (If you are shorter or taller than 5’8″ I would recommend testing it first). 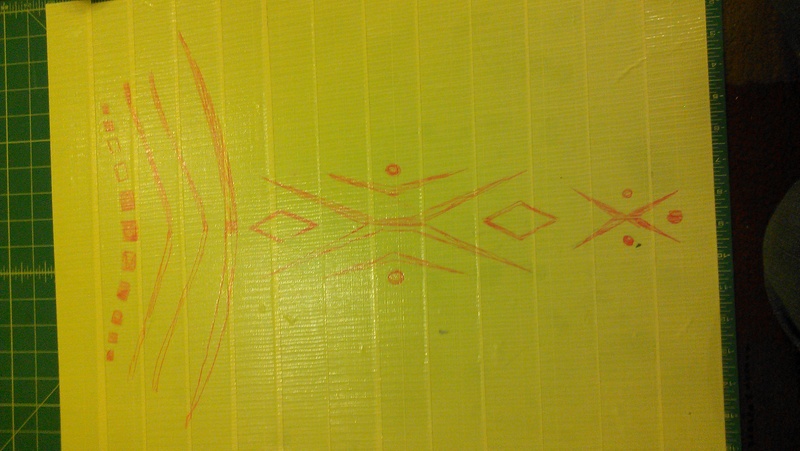 After I calculated those lengths, I grab a bunch of paper and started drawing the design. I only drew half of the design at first so when I transferred it both sides would be exactly the same. When I was happy with the design I transfer the patterns to sheets of duct tape. WARNING: I do not recommend using duct tape. It is a very aggressive tape and can easily tear and/or leave residue on your fabric. The only reason I used it was because I had a bunch left over from a previous project. I made the sheets of duct tape by taking my self-healing cutting board and laying down rows of duct tape. 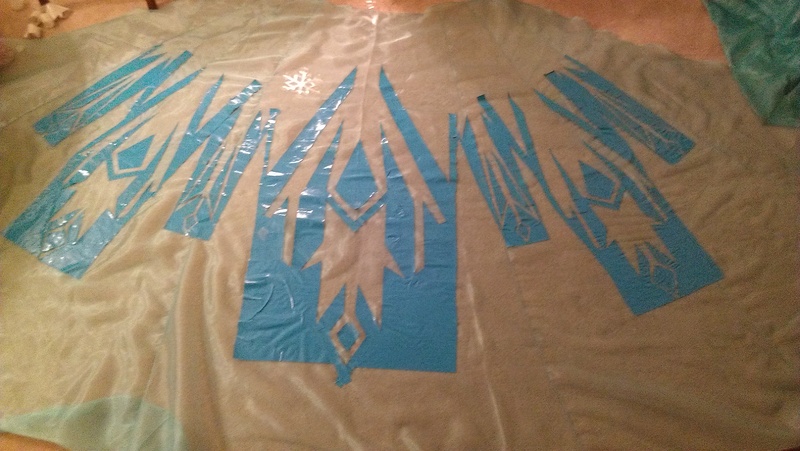 Then drew a line down the middle, lined up the icicle design, traced the first side, reversed the stencil, and did the same thing on the other side of the line. I cut out the designs with an x-acto knife. I did this a total of about 4 times for all my different stencils (not including all the mess ups lol). 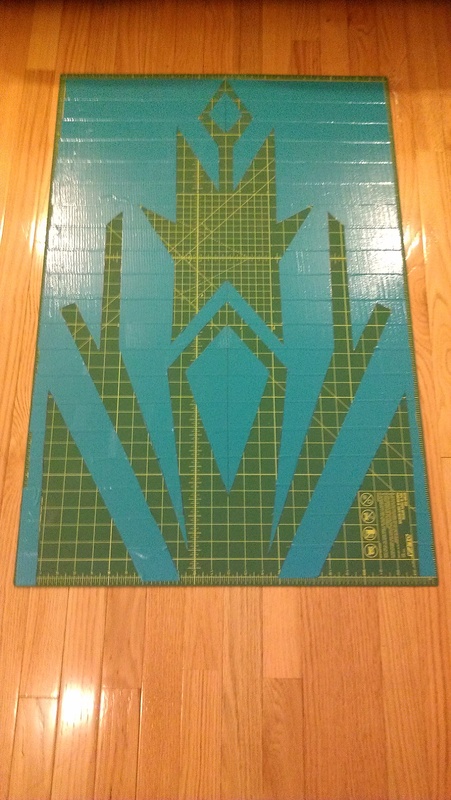 You can reuse the duct tape stencils about 2-3 times before it loses all of its adhesives. Note: Duct tape DOES NOT un-stick from itself, wax paper, anything paper, and a lot of plastics. 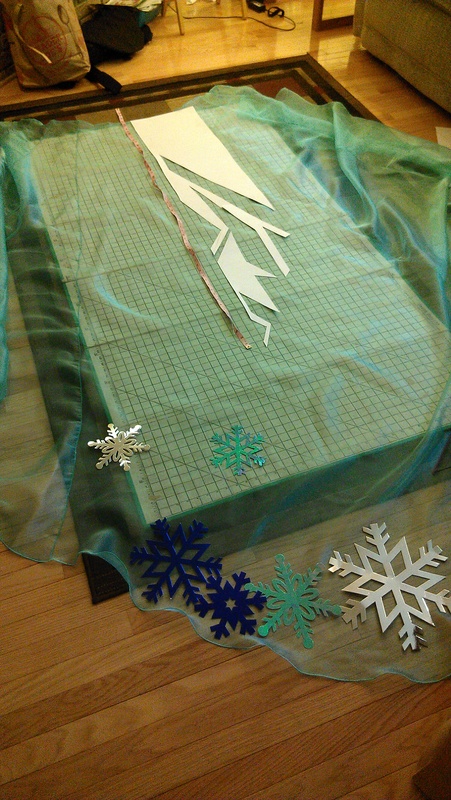 I followed the same basic process to create the snowflake stencils as well. 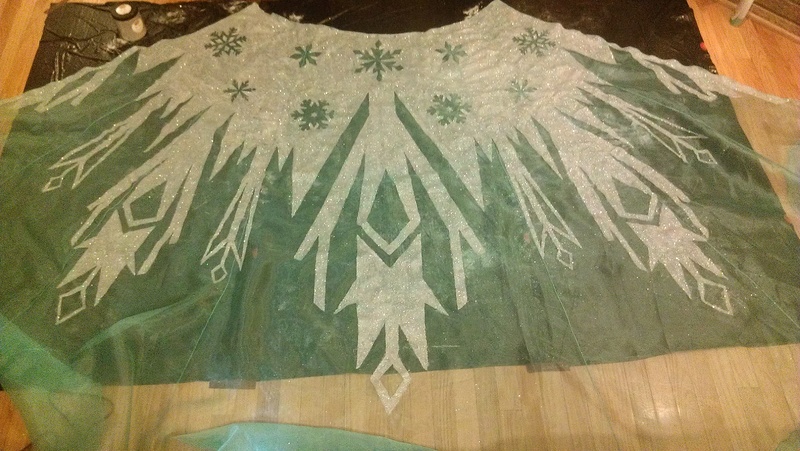 I made a few snowflakes that match Elsa’s cape from the movie and concept art. 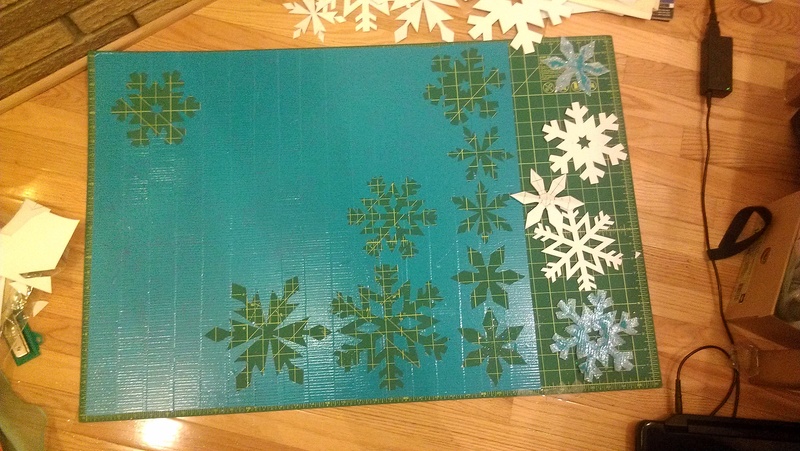 I folded a piece of paper in half and made the snowflake designs with a ruler. 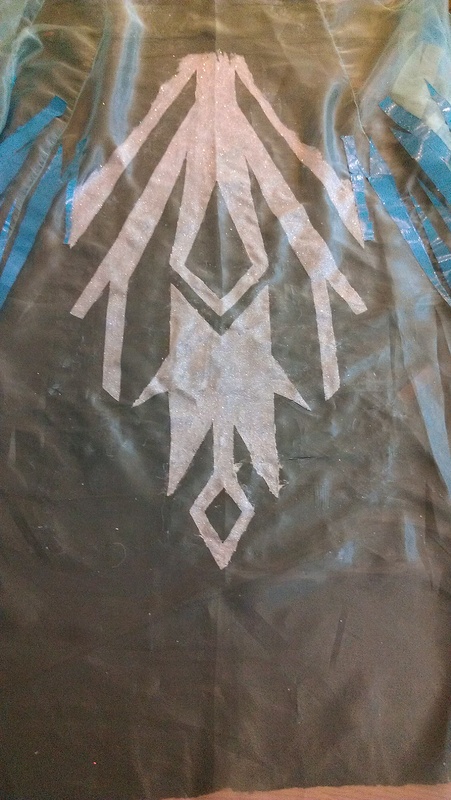 After that I used them as a stencil and transfer them on to the duct tape sheets. For the other snowflakes, I had some paper snowflakes my roommate and I decorated our room with. I bought them at my local craft store called Patcan’s back in November. After all of the stencils were cut out, it was time to glitter the train to death. I took a sponge brush and applied fabric mod podge onto a small sections at a time ( be forewarned the mod podge dries quickly). Then I took a spoon full of glitter and lightly tapped it onto the area with glue and patted it lightly. Do not worry about putting too much glitter on the design the extra will fall off later. After you let the mod podge set for about 4 – 6 hours you need to seal the glitter. ( Please seal your glitter or you will be a glitter monster and the design will fall off). The best way to seal your glitter is to put another coat of fabric mod podge on top of it. It dries clear and wont ruin the design. The other method is to heat seal the glitter. I personally did not do this so I would suggest looking up how to do that on google. If you get the mod podge in an unwanted area the best way to remove the glitter and glue is to take a q-tip or cotton ball with some nail polish remover and GENTLY scrub off the unwanted. 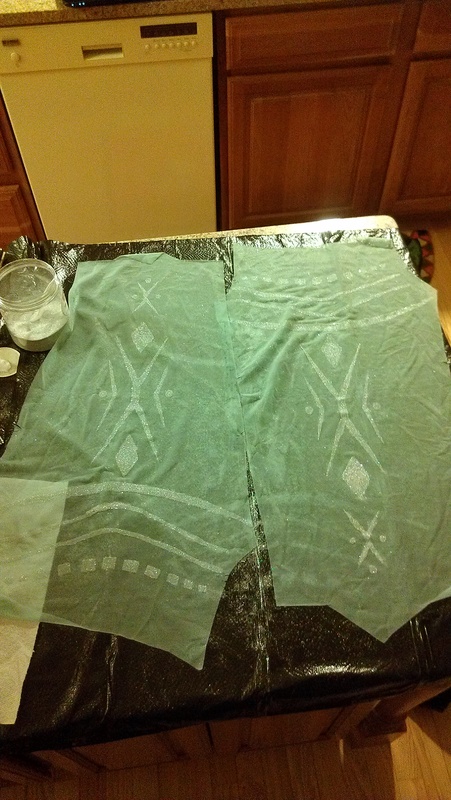 If you are afraid the nail polish remover will damage your fabric be sure to practice on some scrap fabric. 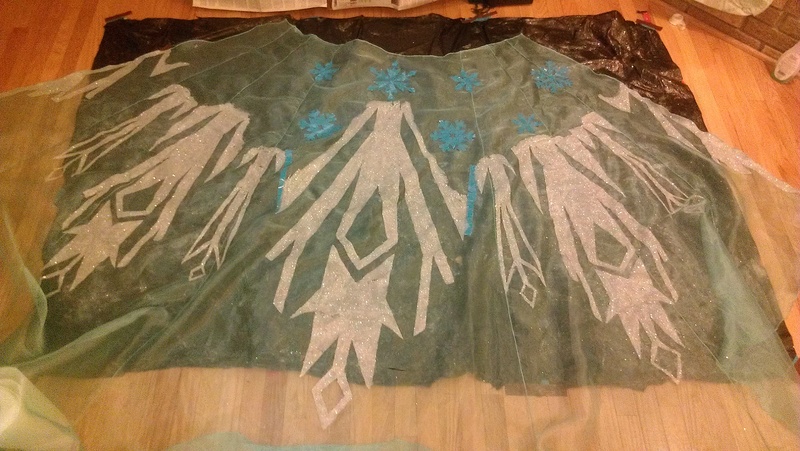 So a lot of time later I had this huge train of glitter and snowflakes. It was quite a bit of work but well worth the results. The pictures do not show how sparkly it is person unfortunately. 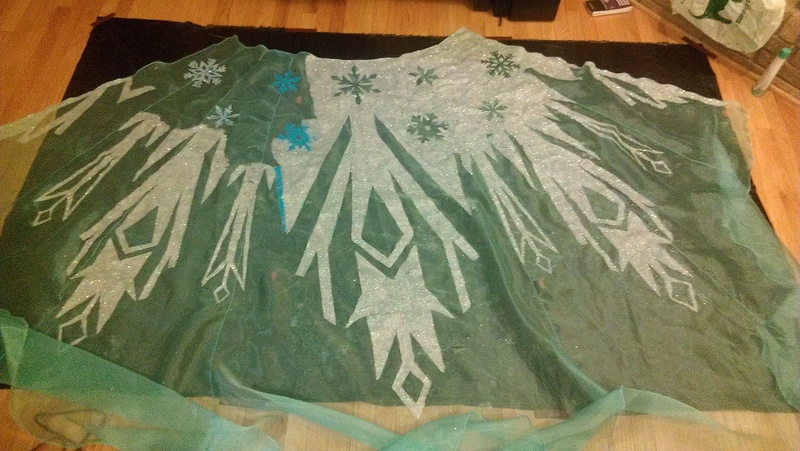 I used the same process for Elsa’s top. 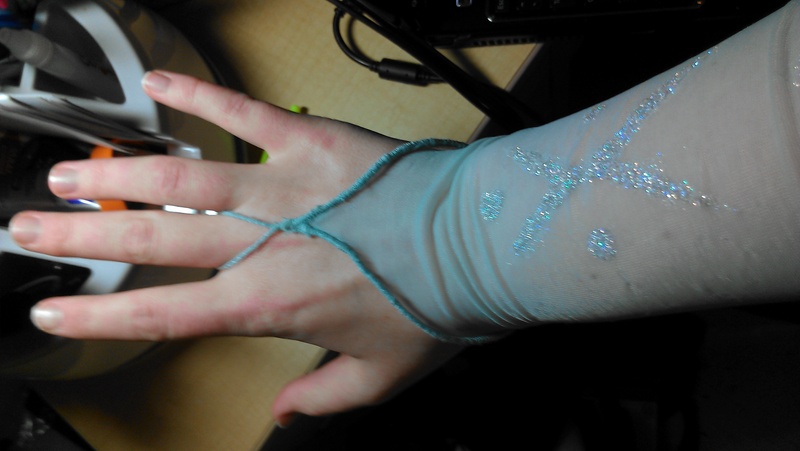 I wont go into great detail how I made it but here are the progess photos of the glitter designs on her sleeves. Sorry for the awkward pose in the last photo I was trying to adjust my body so pattern was clearly visible. I should apologize now for my horrible grammar but I just took a major Bio exam and my brain is kinda out of it. Alas I promised to produced this weekend so let’s begin! 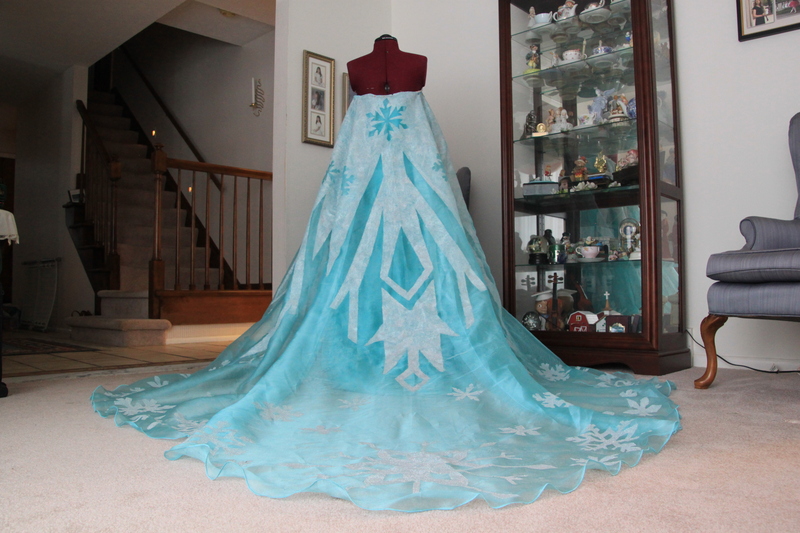 I decided back in early November when I first saw the trailer for Frozen that I was going to have to make Elsa’s ice dress. 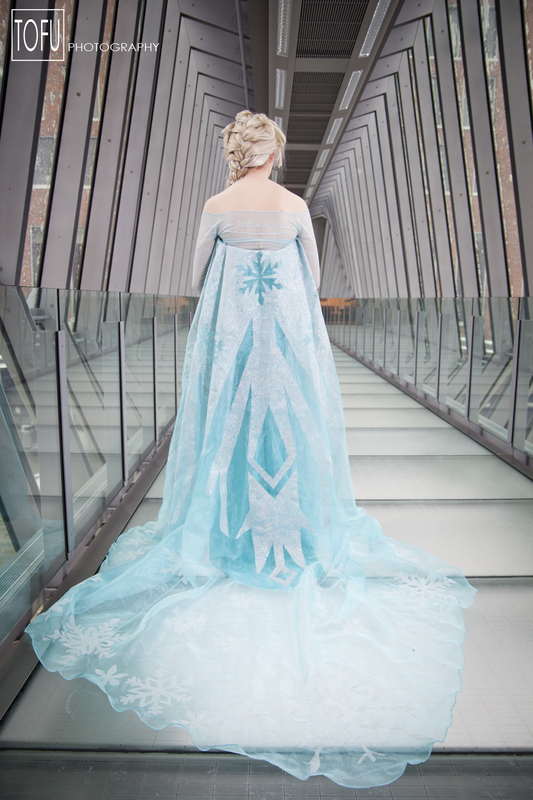 I feel in love with the design and character immediately and sold my soul to make this dress for Ohayocon 2014. It is my biggest project to date and though stressful at times I did really enjoy making it. 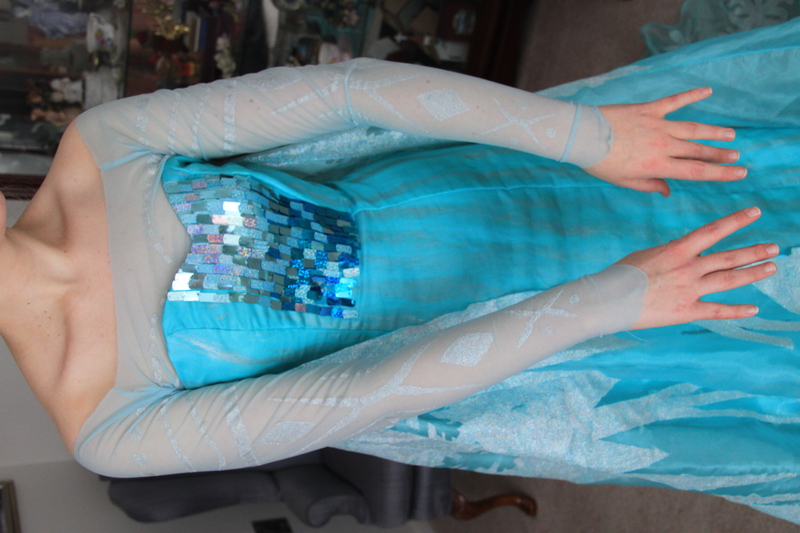 I estimate I spent about 300 hour total hours on the dress and still want to add more detail work to the costume. 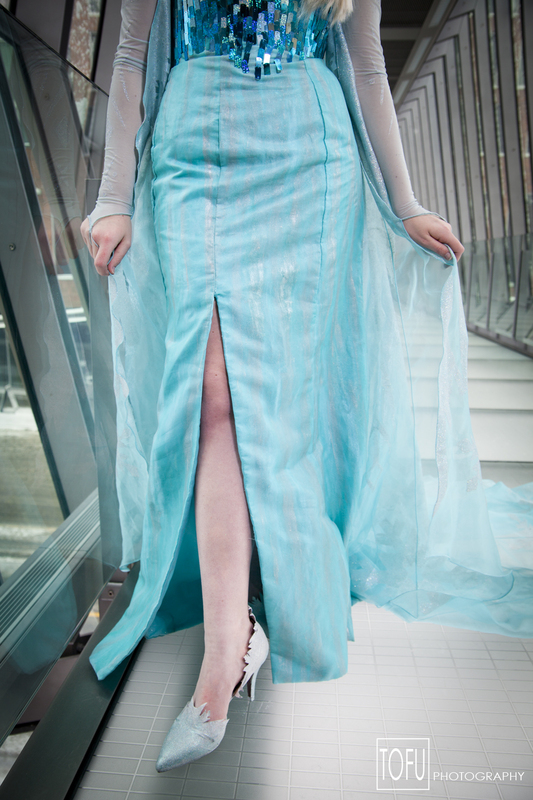 To get the silver lines on my dress I bought lumiere metallic paint in silver and turquoise and painted the organza myself. I needed 2 jars of each color. 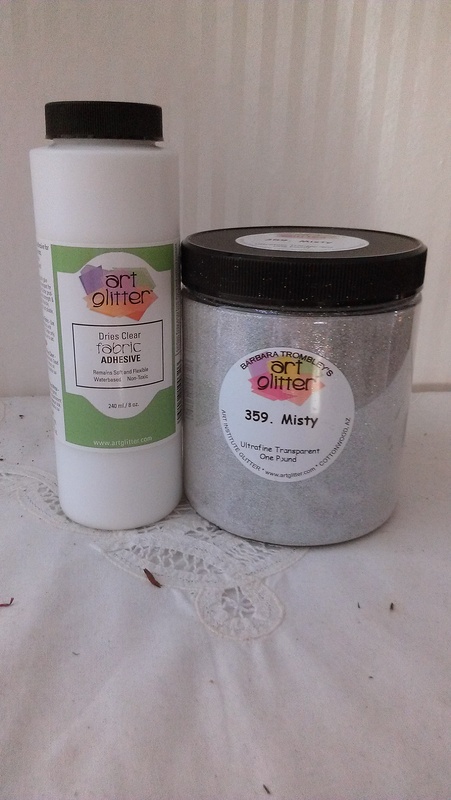 The glitter to make the snowflakes was bought from artglitter.com. This was very very pricey but well worth the cost for the quality. This company specializes in ultra fine cut glitter hence the extra costs. I bought a pound of “Ultrafine glitter in Misty”. There are so many choices it is insane. If I could redo this I would have gotten a few colors and mix them to make a gradient effect. I did buy their fabric glue and it worked well unfortunately I spilled half of the bottle and needed to buy “fabric mod podge” it worked just as well so I would recommend that over artglitter’s glue. Like I explained above I bought a pattern for the main dress but heavily altered it to fit my body and add the extra train in the back. Here is an example of the shape I made to add the train. My train was only 14 inches in the back. Anything longer and it would have been too hard for me personally to walk. 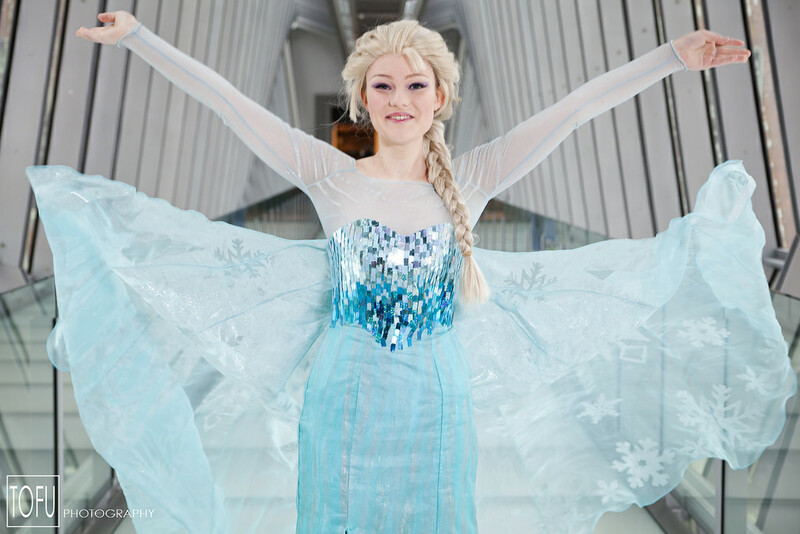 To make Elsa’s top I used a base pattern Mccall’s M6460. I used dress B as my base and again heavily altered the design. 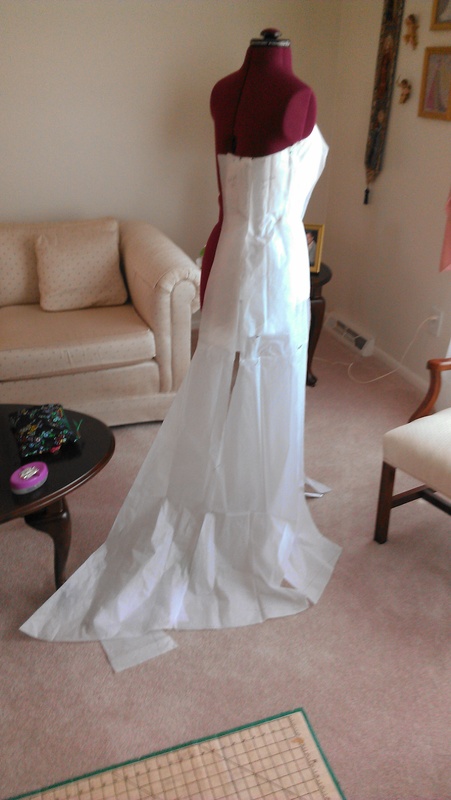 First I made a mock up of the top out of some muslin and tried it on. I marked a line where I wanted it to lay on my shoulders and cut one half of the top. 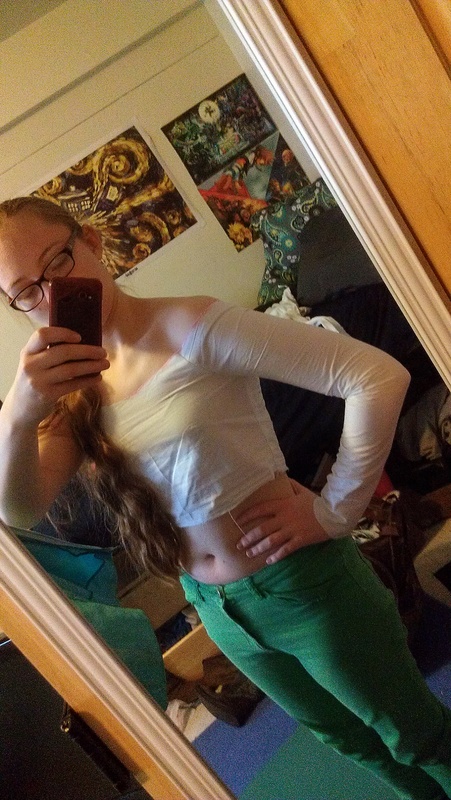 I seamed ripped the shirt apart and used the side I cut as a base for my new pattern. 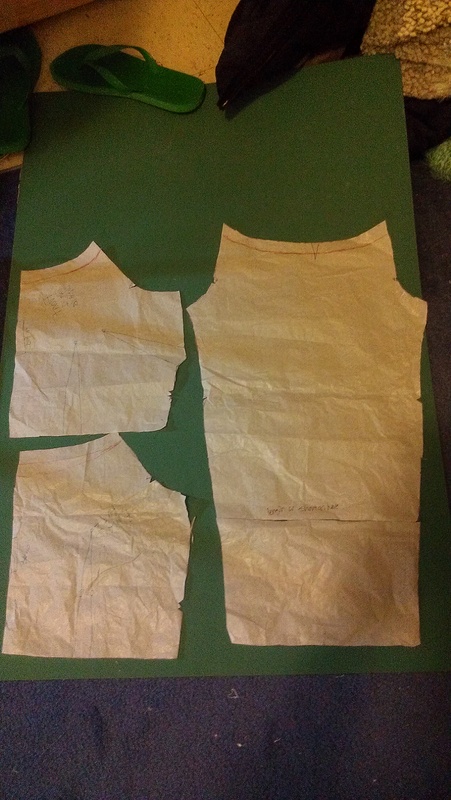 I made the new pattern out of muslin to make sure the top fit properly. After I was happy with the design I cut out the good fabric and assembled it. 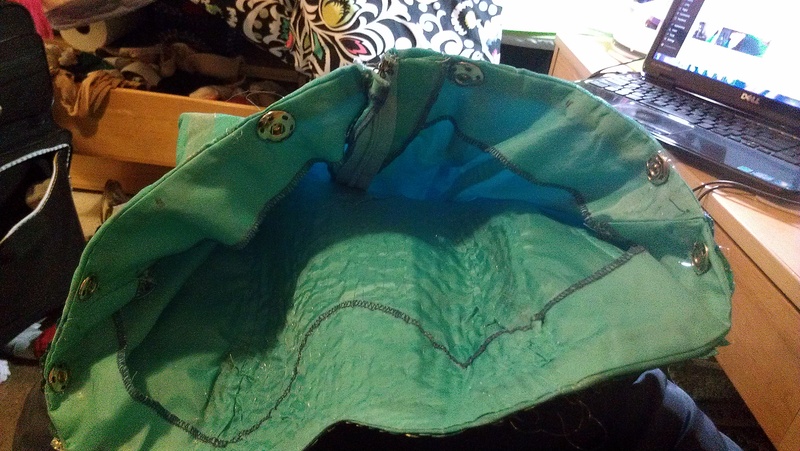 I used a zigzag stitched on all the seams since the fabric was a 2- way stretch. 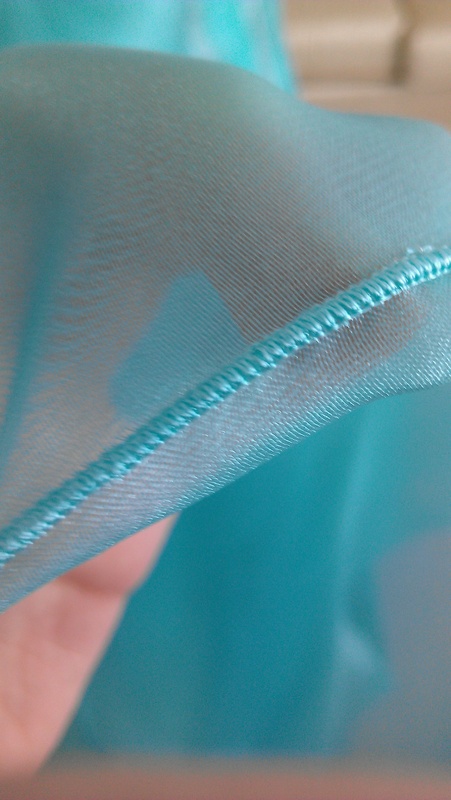 I just hemmed the top with a zigzag stitch too. 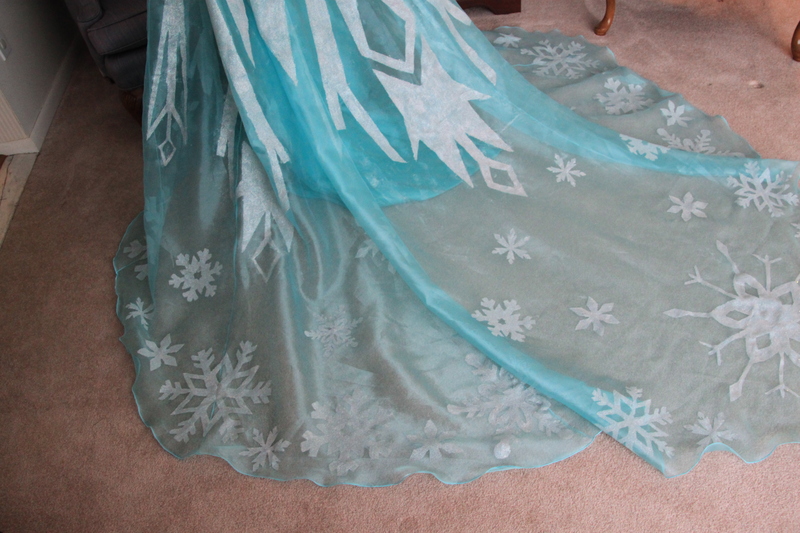 I am going to cover that hem in glitter anyways, so I was not too concerned about making it look extremely appealing. For the hands I took some extra blue fabric and zigzag stitched that to create my finger loops. Since the fabric was stretchy it worked perfectly. After that I sent my zigzag stitched to the smallest width and hemmed the hand since it would get quite a bit of wear and tear. To finish the top I sewed a simple elastic band to the bottom of my top to ensure it would not ride up. I used 1 inch thick elastic. This what I happen to have in my notions drawer but I am sure something half of the size would do the job nicely. I measured where the bottom of the top hit my stomach and subtracted 1.5 inches from that measurement. After that I just gather the bottom and sewed it to the top. 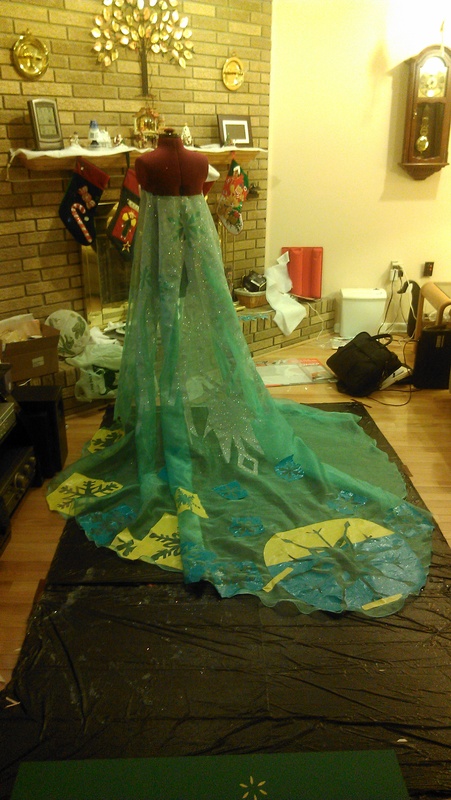 Moving on to the biggest part of the costume, the train/cape. *cue death march*. Ok, it was not that horrible to make but it does require a lot of room which I did not have due to holiday decorations. The pattern is 100% drafted by me so make sure to give me credit if you use this style. I apologize in advance for my crappy diagrams made via paint in 5 seconds. I am pretty a five year could have done better but I hope they get the idea across. I would recommend anywhere from 6-8 yards of a 58 inch wide fabric. 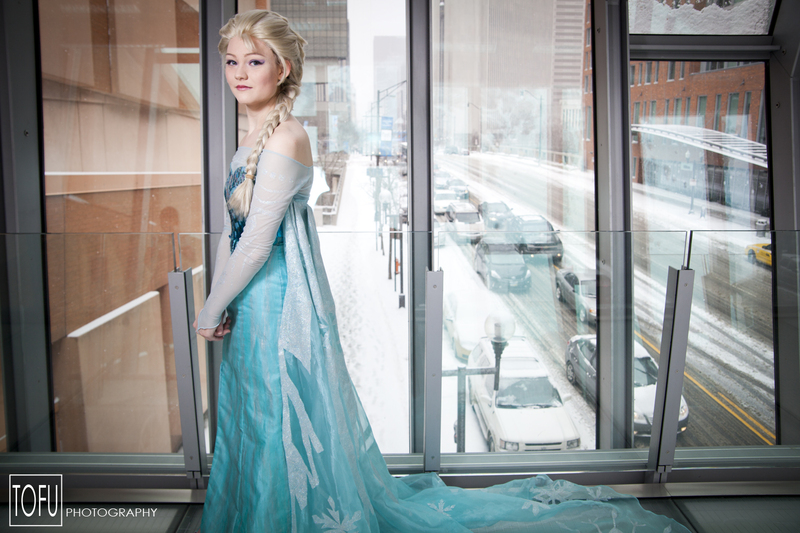 I personally used exactly 8 yards of fabric to make mine. 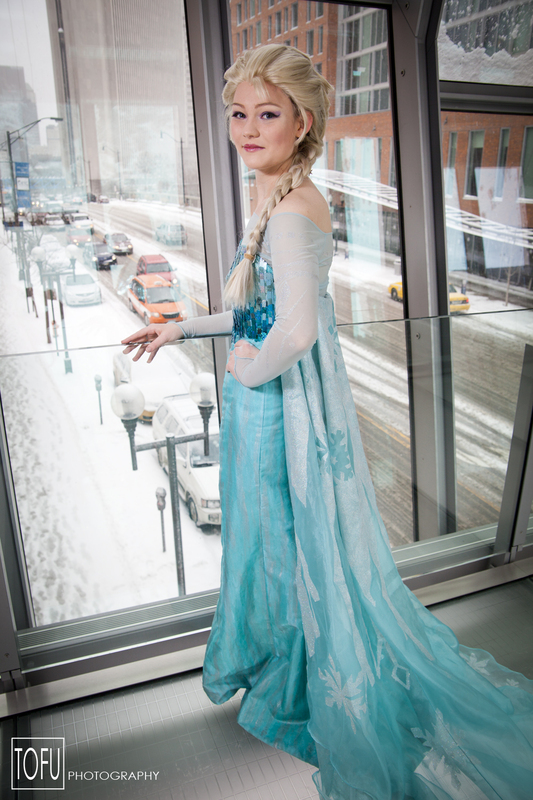 I would not suggest making the train any longer than 100 inches because it will be hard to walk around in and quite heavy with all of the snowflakes. I am also kinda tall (5’8″ft) so if you smaller than 5’5″ft I would suggest 80-90 inches long. Before you dive into the costume I would take time to sketch up the measurements and maybe even make a mockup if you have the resources. 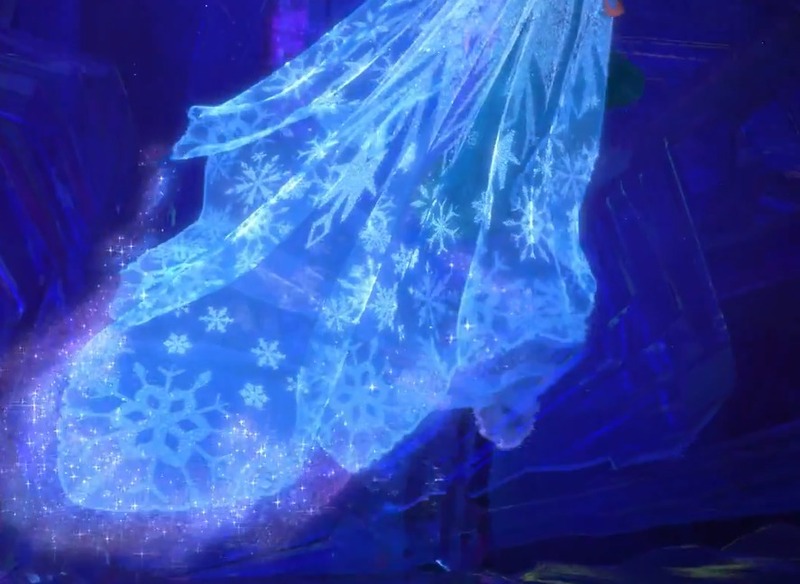 In the movie Elsa’s train is pleated just like her coronation gown cape. There are two main pleats on each side which I did add to the train. To figure out how much fabric I need for the top I measured myself with the dress on to see where I wanted the train to be. 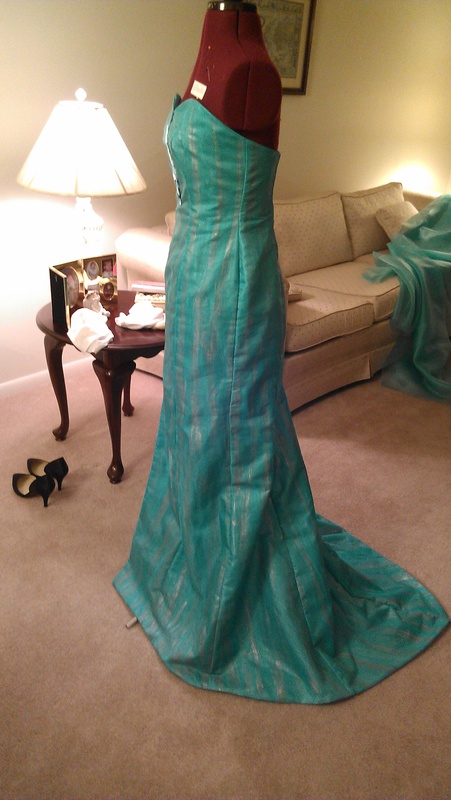 Mine was 20 inches in total but I added almost 12 extra inches for the pleats and seam allowance. 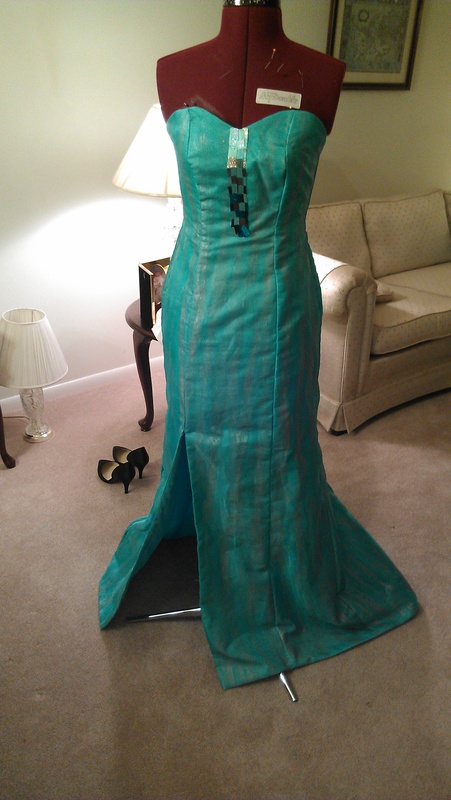 The first pleats in the back were 3.5 inches (7 inches total) and the side pleats were 2.5 inches( 5 inches total). I would suggest playing around with these to see how your fabric falls. After I figured out the top I moved onto the actual train, I divided each side into 4 sections. The largest section is illustrated for you below. To get the 87.5 inches for the other side of the pattern I used a very weird math process which I will try my best to explain. I decided how long I wanted my cape to be (100 inches) then I decided how short I want it to be in the front (50 inches). I subtracted the two numbers (100-50=50) and divide that by 4 (50/4=12.5). I took that measurement (12.5) and subtracted that each time from the four sections to find the opposite sides. My personal measurements were (100, 87.5), (87.5, 75), (75, 62.5) and (62.5, 50). 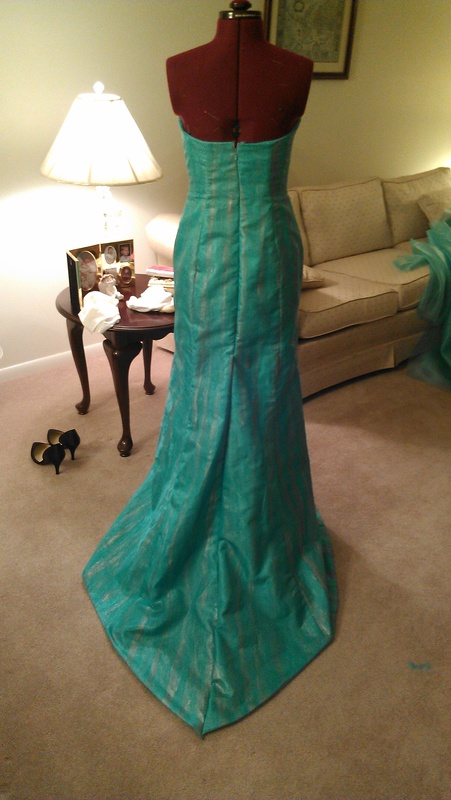 Each width was different due to trying to hide the seams in the pleat. 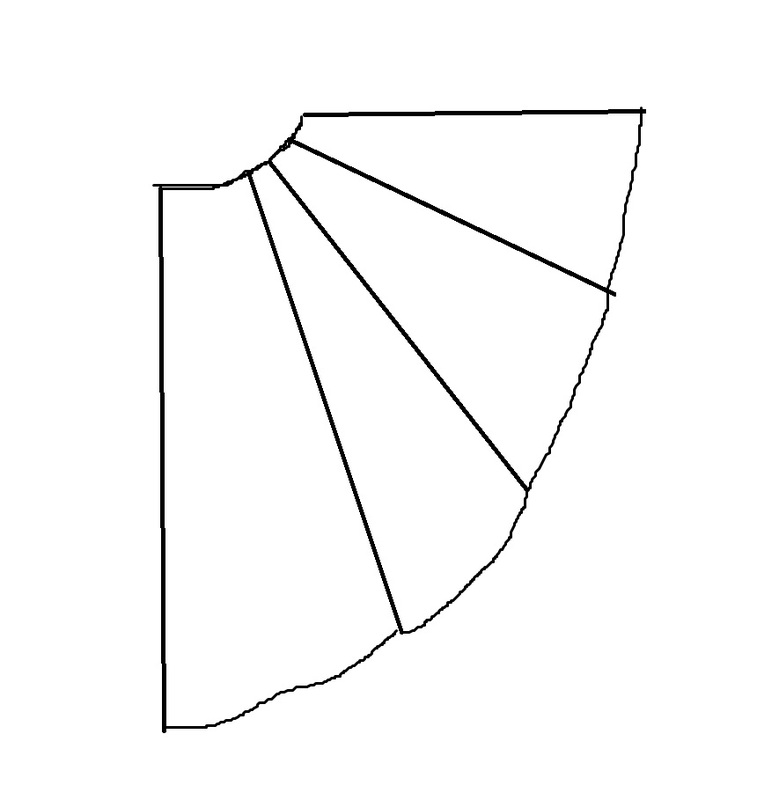 To create the curves at the bottom, I just free-handed the design so it ran nicely into each section. 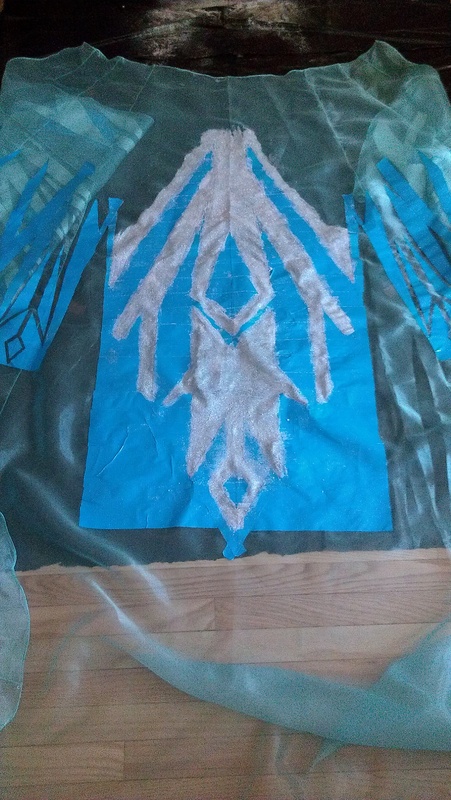 To make my cape appear seamless, I made sure to cut the largest section on the fold so I did not have a seam in the middle. 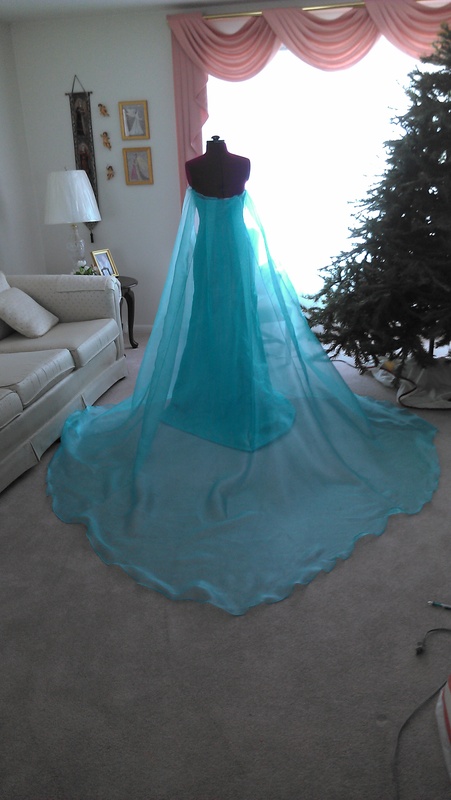 After this I had all my sections and sewed them together then rolled hemmed them on my serger. To attach the train to the dress I sewed some heavy and medium weight snaps along the inside of the dress and on the back of the train. 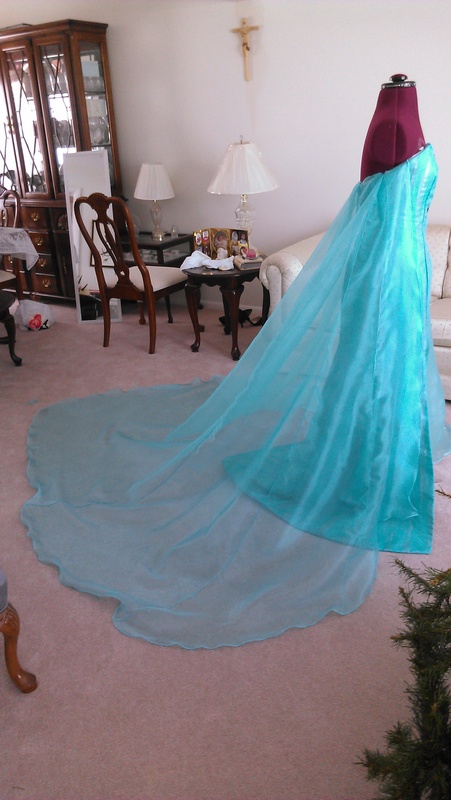 Basically I just fold over the train into the dress and snap into place. It holds up quite well and I have not had any issues wearing it at all. Thanks for reading! I hope this was helpful and actually made sense. If you have any questions feel free to ask and I will try my best to answer. I hope to publish part 2 tomorrow which will be all about glitter and snowflakes!